Moorland Chelsea works Bursley Pottery Spongeware Large Milk Jug. It is made by Moorland Chelsea Works Bursley. Large china mug from the Moorland Pottery Yorkie Ware range. Black & White sheep on a wide bodied mug. Printed marks to base. Item weight: 310gms. Moorland Staffordshire Chelsea Works Burslem Art Deco Style Milk Jug & Sugar Bowl. The Milk Jug & Sugar Bowl each stand about 10 cm high. In the hand-painted Cockerills pattern in. black over cream ground with sponged decoration to rims. Moorland Pottery Yorkie Ware YORKSHIRE LASS Cup Mug. Condition is Used. Dispatched with Royal Mail 2nd Class. Vintage Moorland Pottery Chelsea Works Daffodil pattern Ginger Jar. Blue and white background with deep burgundy hand painted daffodils with pink mottled lid.. In good condition, no chips or cracks. The jar measures 5" tall including lid x 4" dia. Please see the photos as they form part of the description. Thanks for looking, please see my other items for sale, having a clear out. From the Chelsea works Burslem factory. Reminds be of Clarice Cliff pieces in design. ie,jersey, isle wight, isle of man ,guernsey ,scottish remote islands ect.orkney, shetlands. For scale the teapot is approx 15cms high by 7cms in width (across). FOR SALE AN AMAZING HAND PAINTED CLARICE CLIFF DELICIA DESIGN TEA POT PRODUCED BY MOORLAND IT IS IN ABSOLUTE MINT CONDITION HAVING NEVER BEEN USED. A lovely Moorland, Chelsea Works, Burslem, Staffordshire blue & white 13cm tall jug with lovely hearts & flowers & diamond pattern around the top & base. In excellent condition. Widest point of jug body approx. 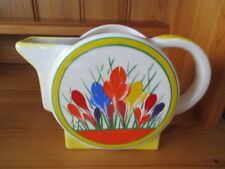 Moorland Staffordshire Chelsea Works Burslem ( Clarice Cliff Style ) Teapot. The Teapot stands 14 cm high. It is in very good condition. Moorland Pottery. Moorland Pottery ' You Can take the Lad out of Yorkshire But you can't take Yorkshire out of the Lad' Gift Boxed Mug. Mug Capacity - The mug holds 11 Fluid Ounces (11 FL Oz.). or 1/2 Pint (1/2 Pt.). Moorland Pottery. Moorland Pottery 'Hare' Gift Boxed Mug. Mug Capacity - The mug holds 11 Fluid Ounces (11 FL Oz.). or 1/2 Pint (1/2 Pt.). Leeds Creamware Pottery. Susie Watson Pottery. Mug height - 3" or 8cm. Moorland Pottery. Moorland Pottery 'Sheep Wooly Jumpers' Gift Boxed Mug. Mug Capacity - The mug holds 11 Fluid Ounces (11 FL Oz.). or 1/2 Pint (1/2 Pt.). Leeds Creamware Pottery. Susie Watson Pottery. Moorland Pottery. Moorland Pottery 'Chicken Run' Gift Boxed Mug. Mug Capacity - The mug holds 11 Fluid Ounces (11 FL Oz.). or 1/2 Pint (1/2 Pt.). Mug height - 3" or 8cm. Moorland Pottery Scots Ware Mug 'Bonnie Lass'. A Scots Ware Moorland Pottery mug 'Bonnie Lass', in very good condition. MAKES A LOVELY DISPLAY ITEM.